Tabbouleh (or Tabouli) is a brilliant and refreshingly delicious combination of vegetables, herbs, and whole grain, creating a powerhouse of nutrition in one simple dish. It may sound unusual or exotic, but believe me, it is easy to prepare and you will appreciate the ingenious use of whole grain wheat and the nutritional herb that usually remains a garnish, parsley. 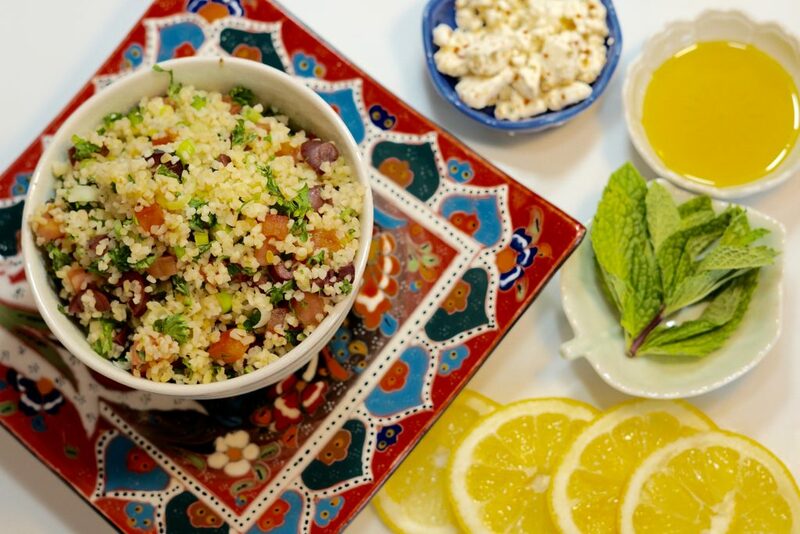 Bulgur or cracked wheat is the main ingredient in Tabbouleh and considered a whole grain. The Whole Grain Council describes bulgur as a wheat kernel, boiled dried and cracked, most often made from durum wheat. One-quarter cup of the Ziyad brand I use most often has six grams of protein and eight grams of fiber. According to the Whole Grain Council, bulgur has more fiber than quinoa, oats, millet buckwheat or corn. Bulgur is parboiled and dried, therefore, quickly reconstituted with boiling water. My favorite bulgur is a golden, medium grain (#2) bulgur, which I find in the international section of my grocer. Parsley, another prominent ingredient in Tabbouleh, is considered one of the world’s healthiest foods. We all remember parsley as an overlooked garnish on our plates. Currently, everyone is talking about the health benefits of kale, but parsley has been on our plates all along. It rivals kale in nutritional value and tastes better! The vitamins, minerals and antioxidant values of parsley are too long to list here, but rest assured, it is green worth eating. This recipe just happens to be a combination of ingredients that I enjoy. Variations of Tabbouleh are numerous. The essence of this dish will be your inspiration in creating a version you and your family enjoys. For example, replace the tomato with pomegranate seeds or add more mint or eliminate it. Quinoa quickly replaces bulgur to create a gluten free version. My father, the Swede, loved sweet pickles and a little sweet pickle juice added to his Tabbouleh. Tabbouleh is a delicious opportunity to consume valuable nutrients. I encourage you to try it and make it a regular recipe in your rotation of meals or side dishes. Rinse the bulgur and place it in a 10-cup bowl or a bowl large enough to allow for the bulgur to double in size and the addition of the remaining ingredients. Add the boiling water, lemon juice, and salt to the bulgur. Similar to potatoes and pasta, it is important to add the salt and lemon juice at this point as the bulgur will absorb the flavor. The salt is to my taste. Admittedly, I love salt. You may add half of the salt now and save the remaining to add if needed before serving. Stir to incorporate and cover the bowl with plastic wrap to seal. Set the bowl aside for approximately one hour. Place the bowl of bulgur in the fridge to chill after all of the liquid is absorbed. Prepare the remaining ingredients, add to the chilled bulgur and stir to incorporate. Refrigerate your Tabbouleh for one hour before serving. Add pepper to taste and, if necessary, additional salt to taste before serving. Now, go lift some weights, you health warrior! Questions? Comments? We love hearing from you!